The WAKU Telescopic Ladder is the Original Ultra-Versatile Telescopic Ladder manufactured in Germany from high-quality materials with attention to detail and is extremely easy to handle. The WAKU Telescopic Ladder is adjustable rung by rung to almost double its height, and safely locked by four strong spring pins. Therefore one ladder replaces a complete range of step ladders of different heights. According to the type of work the user can always adjust the ladder to the most convenient height. For transport the ladder is small and must only be extended to the required length when in use. 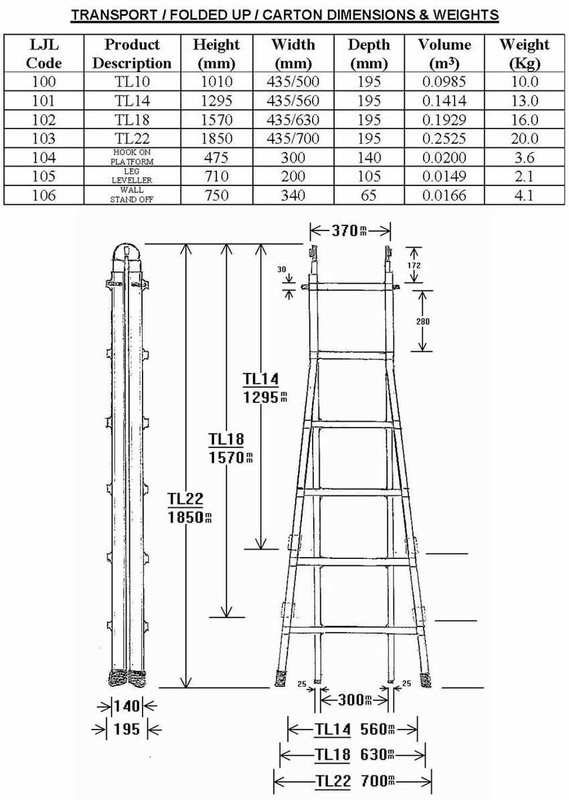 The inner ladder can be telescoped upwards so that the height of each leg of the ladder is adjustable. It is this facility which makes it useful on uneven ground like slopes or even on staircases. ​The WAKU Telescopic ladder has an automatic safety hinge; by simply adjusting the automatic safety hinge the step ladder converts to a straight ladder, which can be extended rung by rung to almost four times its original transport size. Only one WAKU Telescopic Ladder is required. Inner and outer sections are easily separated and the two outer sections joined using the height adjustment pins. You now have two trestles and need only a plank to start work. ​1. Maintenance-Free WAKU Quality: rugged stainless steel pins reliably and visibly lock the sturdy, corrosion-proof aluminium hinges. 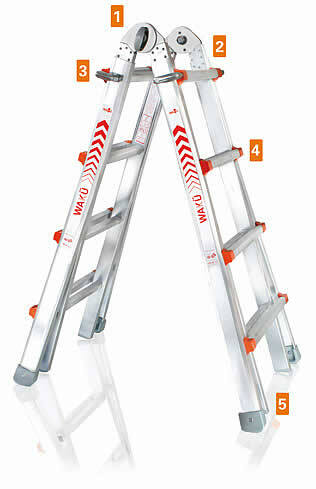 Step Ladder 3-5 Rungs 1.34m Max. 4-7 Rungs 1.86m Max. 5-9 Rungs 2.40m Max. 6-11 Rungs 2.92m Max. Extension Ladder 6-10 Rungs 3.10m Max. 8-14 Rungs 4.20m Max. 10-18 Rungs 5.30m Max. 12-22 Rungs 6.40m Max.